The difference between "Made in Tasmania" and "Product of Tasmania" is crucial to understanding why Tasmania is yet to make its own whisky. The Tasmanian Whisky Producers Association editorial sub-committee demanded that the section below (originally entitled "Exhibit A") be struck from the book because it criticised the Hellyers Road Distillery, which had (perhaps unwittingly) embarrassed itself by labelling its Peated Whisky as a "Product of Australia" when, patently, it was not. All whisky is “made”. Distilled barley spirit is often called new make, yet it is a product. Simultaneously, the 'produce' is frequently understood as the factors, or ingredients, in a product. But neither of these are the sense of the word used in Australian consumer law which allows two claims: "Made in Australia" or "Product of Australia". "Made in Australia" is straightforward: it means what it says. But to bear the three words Product of Australia the whisky must not only be made in Australia but also be made entirely of Australian ingredients processed entirely—or virtually entirely—within Australia. Bill Lark told me that when he consulted Food Standards Australia ‘They insisted I put the words Product of Australia on all my labels’. And following him, the most common claim put onto Tasmanian whisky labels is "Product of Australia". On a strict interpretation, (assuming Lark correctly stated his ingredients and process) Food Standards Australia misled Lark and not one of Tasmania’s current whiskies is a Product of Australia, let alone Tasmania, because one of the three ingredients, yeast (as well as, arguably, grape or bourbon spirit or fortified wine) and/or two substantial transformative process (fermentation and then maturation in French or American oak) rely on non-Australian materials transformed outside of Australia. So what about a whisky made from barley grown in the United Kingdom, malted at Inverness in Scotland, imported into Tasmania, fermented by a Canadian yeast and aged in American oak casks infused with sweetcorn liquor? What is that a product of? 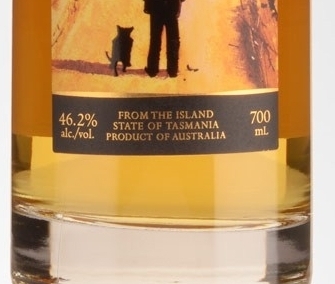 Hellyers Road distillery does this, and then fixes a label claiming “From the Island State of Tasmania. Product of Australia” and markets the whisky as having “the very taste and character of Tasmania”. The industry has considered the issue. The Hellyers Peated Whisky whisky meets the Tasmanian Whisky Producers Association definition of Tasmanian whisky. Indeed, Bill Lark informed me that the definition was framed to allow this whisky to be labelled Tasmanian. The TWPA's definition generates a peculiar consequence: a whisky can fail the Product of Australia test yet pass the Tasmanian Whisky test.